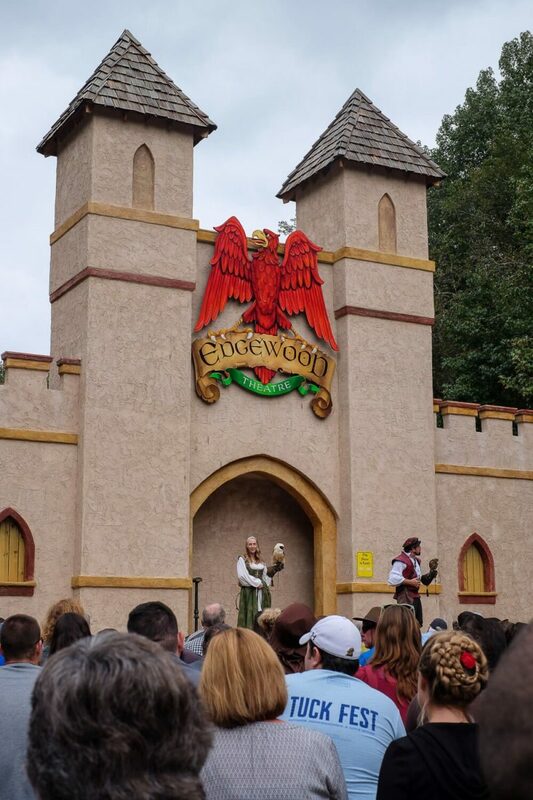 Carolina Renaissance Festival: 5 Tips For Your Visit! 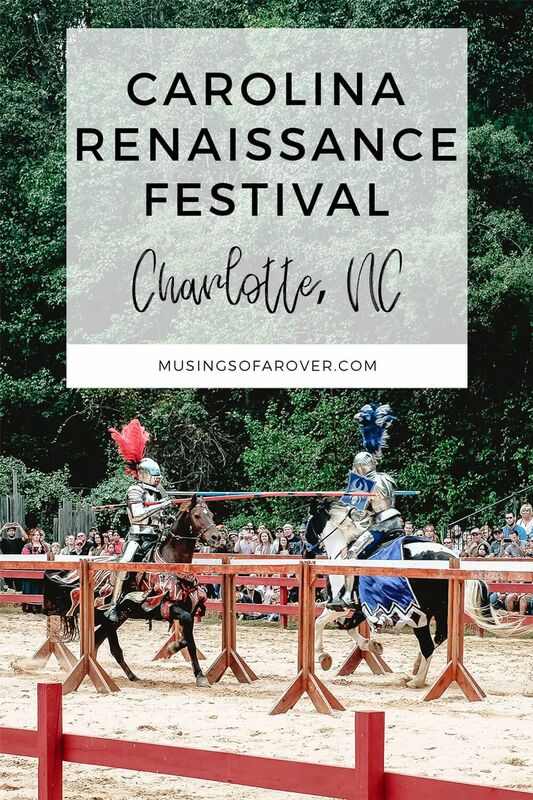 Are you a first-time visitor to the Carolina Renaissance Festival and want to know what to expect? After several consecutive years of visiting the fair, I know my way around and I’ve put together this list of my top tips. I hope my suggestions will help orient you to the festival, help you plan (or decide not to plan) your day, and begin to show you what to expect. And even long-term visitors may like some of my suggestions. 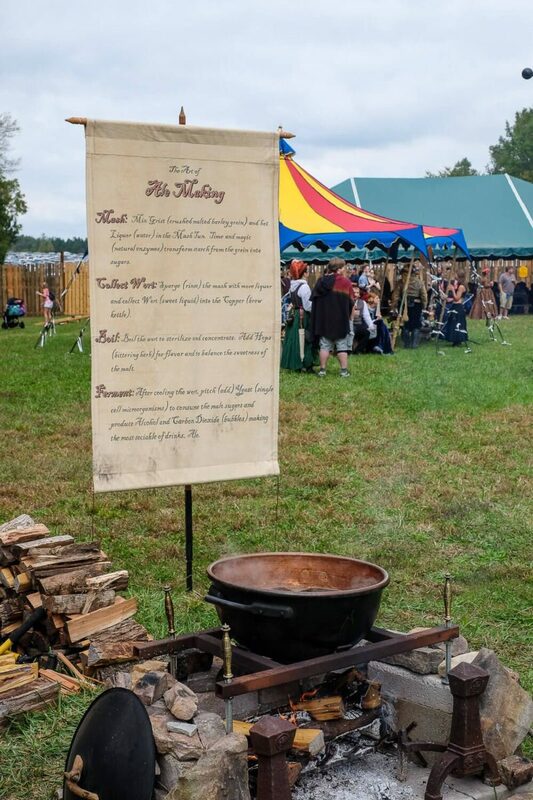 So why do you need tips for visiting the Renaissance Festival? Simply put…it’s huge! I was blown away by its size the first year I visited and I was totally unprepared for how to handle our day. I don’t want the same to happen to you! 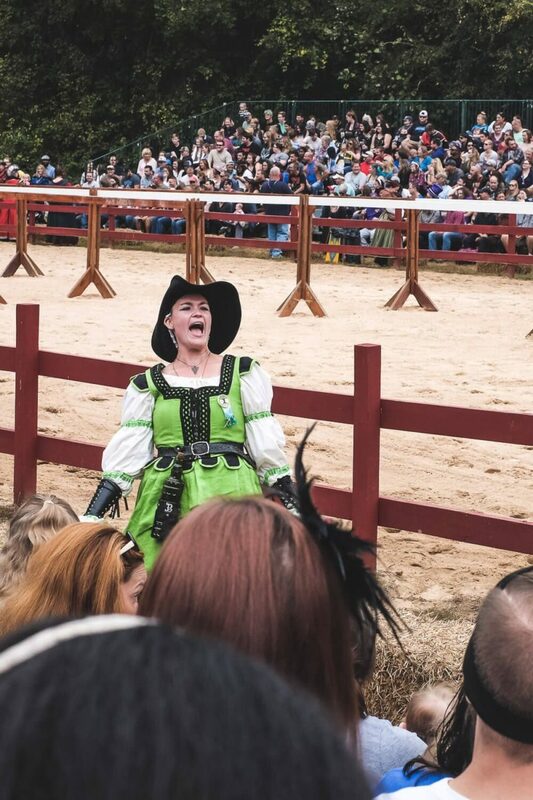 So without further adieu, here are my top 5 tips for your trip to the Carolina Renaissance Festival! Seems so simple but I really mean it. 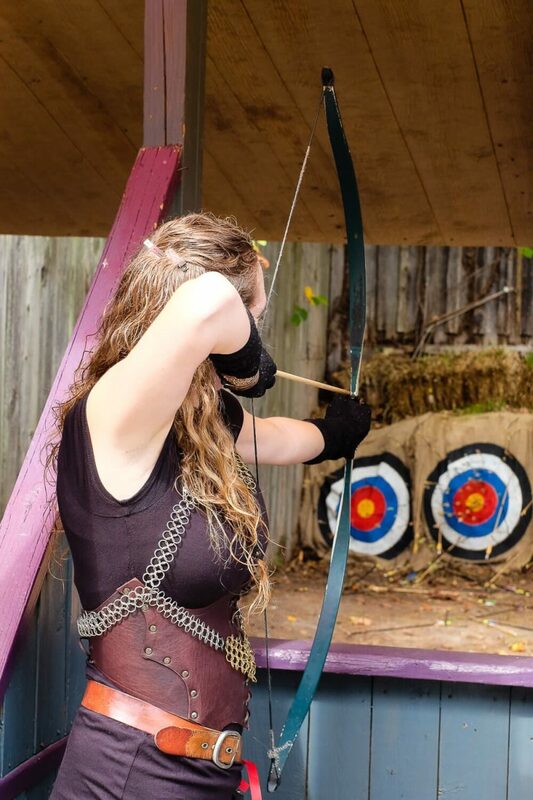 The Carolina Renaissance Festival is open every Saturday and Sunday from 10am-5:30pm (from late-Septmeber to mid-November). If you’re going for just a day, those hours don’t give you a ton of time in the festival. If you want to maximize your day and do as much as you can, I’d try to get there when the gates open at 10am. But that’s not my only reason. Though parking may be free, there is a ton of it. If you arrive later in the day (like around noon), you may have a 20 minute walk (at least) to the gates. And that’s not counting the time you may spend in the car waiting in line to park. The first year we arrived at the Carolina Renaissance Festival, we arrived around noon, waited in line to park for almost an hour, and then had a very long walk to the gates. So plan to arrive when they open. This kind of goes hand in hand with my next tip, but I think the jousts deserve their own mention. And I may be partial to them because they are my favorite part of the festival. But the jousts. 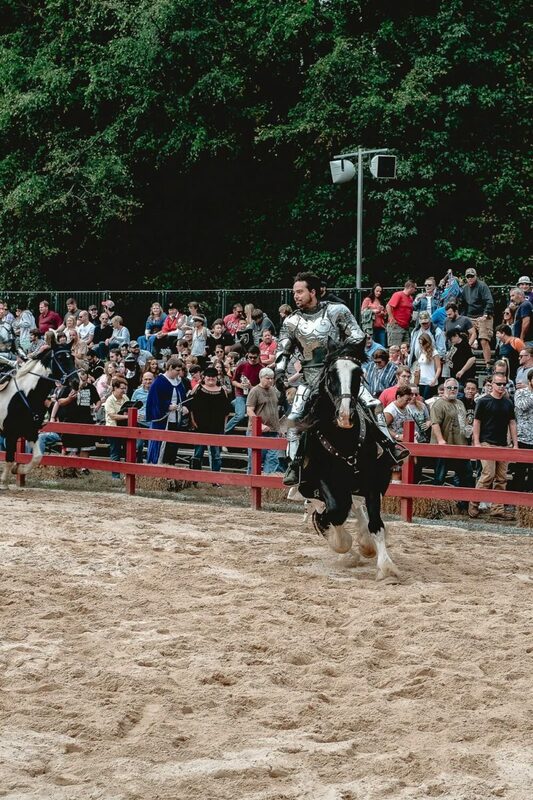 Yes the Carolina Renaissance Festival has real actors and stuntman performing jousts. It is really cool and amazing! But it’s not all day. There are only three tournaments a day. The first two are more tame. They do tricks and skills, and there is jousting between the knights. But the last one is my favorite. Mostly because this is more interesting (it is to the “death”). But it’s good to know that all of the tournaments are tied together. It creates one “story” for the day. 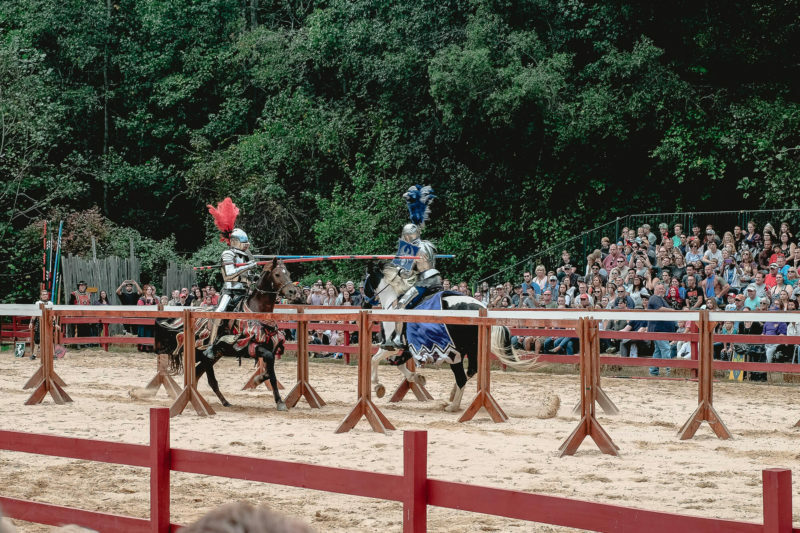 If you’ve never seen any jousting, I’d plan for seeing at least one of the shows. I usually go to two. But my biggest tip for the joust? Think about which one you want to go to and then arrive 20-30 minutes early to get a seat. If you don’t, you won’t get one. And sitting in the bleachers will let you see much more. For the Joust to the Death, I’d definitely arrive ~30 minutes early. If not earlier. There are so many shows. With like 14 stages (plus the jousting) and with shows on the stage every hour or so, you will never be able to see everything. I enjoy wandering through the festival and letting my eyes and ears take me where they will. If a particular show catches my attention, I’ll stay. But if I know I want to see something, I’ll plan for it. Like the jousts above, most acts only have a 2-4 shows a day. If you want to see them, pick a time and then aim for it. But I wouldn’t pack your day full – you’ll miss the wandering – but a couple won’t run you ragged. Also it’s important to note that some of the “adult-themed” shows are at the same time as the last joust. Tortuga Twins – Rated R Show (usually at 4:30pm). This show is hilarious (their last one of the day), but they have “friendlier” shows earlier in the day. Ancient Art of Falconry. I love see these bird-themed shows! And with 4 a day I usually catch one. CRAIC Show. My time studying abroad in Ireland left me with a love for this show. The Knotty Nauticals. A little slap-sticky, but still a good time. And their “Naughty Show” is funny. Washing Well Wenches. I first saw this act a long time ago at the Pittsburgh Renaissance Faire. I loved them then and I love them now. The “sisters” are quite funny, and they participate with the crowd. I’ve also enjoyed watching the belly dancers and of course catching all the music. I love to just stop for a bit at any show that catches my attention. Last year we sat for almost 30 minutes listening to this amazing harpist. Here is where you can find the complete list of events! 4. when you see something, do it! The Carolina Renaissance Festival is enormous. It’s 25 acres with castles, stages, food stalls, theaters, vendors, pubs, games, demonstrations and more. It. Is. Huge. The first year Ryan and I decided to walk through it first to get oriented and then swing back to the things we wanted. Do not do this! There’s not enough time to go back sometimes. Especially if you’re at the far end and now you want to play that game that was back at the beginning. You’ll spend far too much time walking and not enough time enjoying the faire. And your feet will hurt. For example, they have an archery stand. If you want to do this, I’d go ahead and do it. The others further into the festival may not be the same. Or, like the axe-throwing stand, it may be the only one. Same thing for any demonstrations. I like to pause at the glass blowing and the blacksmith areas and watch for a bit. Then when I’ve had my fill, I move on. And while food does repeat throughout the fair, you may not find the same things at each stand. And some food stalls may be unique in what they offer. If you’re hungry, get it! Shops are harder. If what you want is big, you may want to wait till later in the day (unless you are afraid they’ll sell out). I’d ask if you can buy it and then keep it at the stall, or ask when they are planning to close so you can come back before the end of the day. If it’s a small item, maybe go ahead and get it. But I do know that carrying around stuff all day is a pain. The choice is yours. Yes credit cards are accepted at the main festival box office. But inside the festival most of the vendors are independent. What they accept is up to them. If you are buying something from an artisan, I would expect them to accept credit cards. But if you are playing a lot of games or buying beer and food, I would rely on cash. You’ll move quicker through the lines and a lot of the games don’t accept credit cards anyway. Then there are the tips. At the end of each show the artists will ask for tips. If you enjoyed the show and want to support them, then throw in a couple of dollars. I’d bring several $1 bills for this purpose. If you forget cash though there are ATMs inside the festival. Though be prepared to pay a fee with them. I think the festival has a lot to offer for everyone. Food, beer, games, rides, music, jousting, and more. I love walking around and seeing all of the crafts and demonstrations. And though renaissance fairs may be a bit “nerdy,” I don’t care. I love them. Oh and I dress up to! I love dressing up and I love that your options are like endless at a renaissance festival. So if you want to dress up, go for it! Plenty of others will be as well! You can even rent costumes at the gates (before you go in), if you forget your own and want to join in on the fun! Please note that even though you can bring bladed weapons to the fair, they will tie a red ribbon around it and warn you never to take it out of its scabbard or you will be evicted. When is the festival? 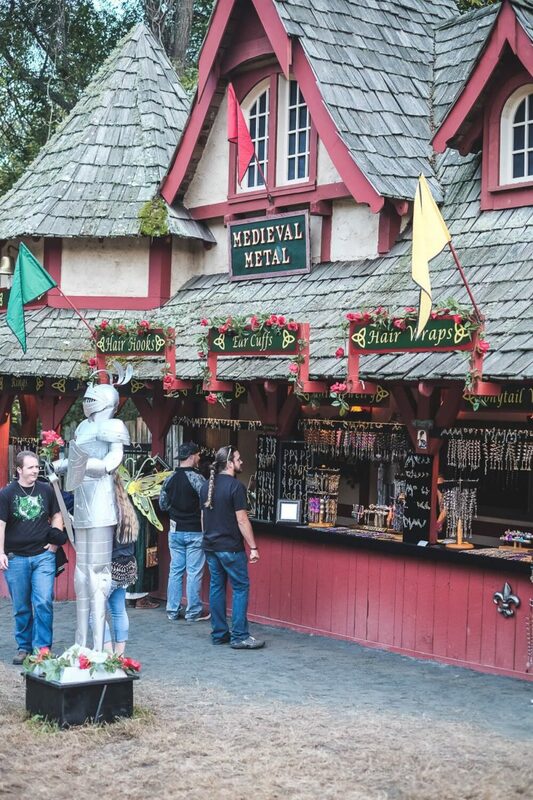 The Charlotte Renaissance Festival is open every Saturday and Sunday, from September 29th through November 18th (2018). Where is the festival? Located outside of Charlotte, the fair has two main entries. The main one is at: 16445 Poplar Tent Road, Huntersville, NC 28078. But be sure to check this page for directions to their other entrance as well! How much does it cost? Bought in advance tickets are $24 for adults. At the door they are $25. Children, seniors, and military personnel are less. Check this page for exact rates and details on how to buy them early!